Dr Maher Al Ahdab shows you 6 easy ways to get and maintain beautiful skin and a healthy appearance. In this age of social media, good looks are desired more than ever. And it’s not just the women who are looking to improve their appearance – men are becoming more conscious of their looks as well. As desirable as it is to look good, it is also important that a good appearance should be easy to maintain. Dr Maher Al Ahdab gives his top tips for gaining and maintaining a young and healthy appearance. The foundation for looking good is in a healthy body. So, following a healthy diet and giving your body the right nutrition is extremely imperative. A healthy and balanced diet, rich in vitamins is important for the skin. Vitamins B and A, which are found in green vegetables, anti-oxidants that fight aging, found in berries, and sufficient amounts of omega-3, found in fish, are some easily available options. Exercise regularly. Exercise activates blood circulation and gives you a sense of energy and vitality. Regular movement helps to keep the body agile and sporty, and hence beautiful. Get enough sleep. Our fast-paced lives have meant that we sacrifice on the number of hours our body gets to rest and rejuvenate. Get rid of the excuses and make sure you get at least eight hours of sleep every day. This is the basic time required for your skin cells to repair DNA and regenerate. Drink enough water. Drinking about 2 litres, or around 8 to 9 glasses a day is required to maintain moisture in the body. Well-moisturised skin is soft and supple, and more effective in fighting signs of aging, like wrinkles. Protect yourself from the sun. While some amount of exposure to the sun is necessary for Vitamin D, which is essential for building bones, you must be smart about it. Limit your exposure to the sun during peak hours, and not matter what time of the day you step out, cover yourself with a good sunscreen. The UV rays of the sun can cause pigmentation and age the skin faster, so it is important to keep it protected. Stop, or limit smoking. Smoking is not only injurious to your internal health, but can affect your appearance as well. Smoking causes the appearance of wrinkles and darkens the colour of the skin. It can also cause the skin to sag and lose elasticity, making you look older and dreary. Dr. Maher Alahdab (A.K.A. “Skilled Surgeon” as he is known on his hit TV show) is a leading double-board certified plastic surgeon in the middle east and one of the most trusted names when it comes to cosmetic surgery. 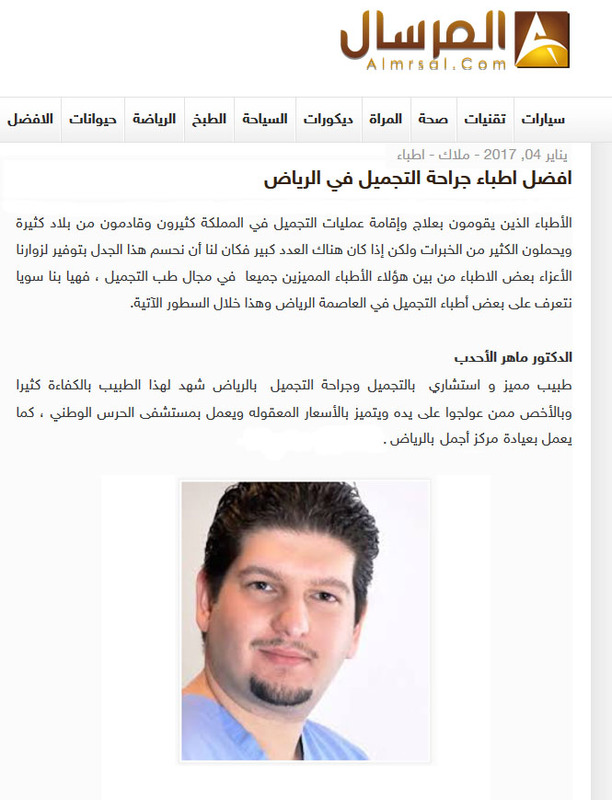 He was also selected as the best plastic surgeon in Riyadh for 2017!